Your smile is your trademark! We have dentists and hygienists on staff to help you produce the healthiest mouth and brightest smile! Our team services patients in house, mobile units and school based. 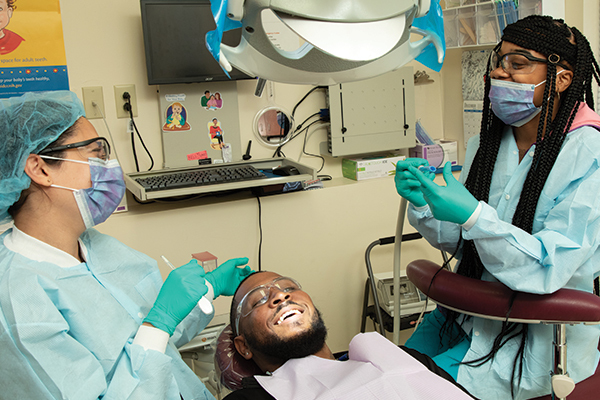 Services include routine teeth cleaning, dental exams, fluoride varnishes, sealants, x-rays, oral surgery and simple extractions (exceptions apply), limited root canals, crowns, bridges, and dentures. Our dental team advocates for pediatric mouth and teeth care. Dental policies differ from medical procedures. When scheduling dental appointments, please call 314.367.5820 and ask for the Dental department.